Foreigners and NRIs will soon be allowed to book Indian Railways train ticket online for domestic travel in India. Tickets can be booked using credit cards and debit cards issued by foreign banks. IRCTC is making the necessary changes in the system to allow international transactions for ticket booking on domestic trains. 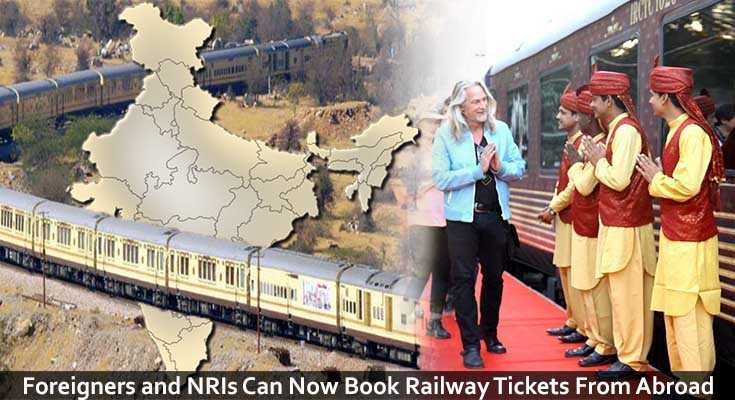 To enable hassle free ticket booking for foreigners and NRIs, Indian Railways is in the process of making the necessary changes to the system. Currently tickets for any domestic travel for NRIs and foreigners are booked through travel agents. The popular trains used by international travellers are the luxury service trains like 'Palace of Wheels', 'Maharaja' and the trains in the Buddhist circuit which are booked through tour operators. Currently the website only accepts AMEX card - a foreign debit or credit card for booking. This card only allows booking on some of the selective trains and the account must first be verified by Indian Railways before using it. But an Indian mobile number is required for this. In case one does not have a cell phone number, it is a lengthy process as one needs to email Indian Railways their passport number. According to Indian Railways this system existed earlier but was stopped after there were few cases of misuse of credit cards. IRCTC confirmed that going forward there will be certain checks in the website to prevent misuse of the system and measures will be taken against hacking. The job is currently done by a website security expert known as STQC, Standardization Ticketing and Quality Control. IRCTC is currently equipped to book 15,000 online tickets in a minute. Presently 58% of total tickets sold are booked online. They are also working to solve some issues with the website. They have also included multi-layer security measures against hacking. The system is expected to be up and running soon. Last year there has been a Rs 18,000 crore ticket sale and this financial year it is expected to touch Rs 25,000 crore mark. Besides luxury trains, foreigners will be able to book tickets for regular services also once the required system gets operational on the IRCTC ticketing site. Talgo Train Trial At Speed Touching 200 kmph Planned In June 2016.